Tiger Woods carded an improved second-round 70 but remains in last position at the Hero World Challenge in Florida. The former world number one, 38, had a double bogey on the last but his two-under round lifted him to three over. Fellow American Jordan Spieth holds the lead on 11 under although he has a hole to play after bad light curtailed play. Sweden's Henrik Stenson (68) is second on nine under, a shot ahead of American Patrick Reed who had a nine-under 63 and England's Justin Rose who had a 64. Rose, the 2013 US Open winner, sank an incredible 11 birdies in his eight-under-par round, five in the last seven holes, while Reed knocked in five birdies and an eagle in his opening nine holes. But all eyes were on Woods, who hit several chips like a high-handicap golfer in his five-over opening round. The 14-time major winner told Sky Sports that his second round performance "wasn't a whole lot different" to his opening round. He said: "I maybe hit two less worse shots than I did on Thursday. It's not very good. I'm just going to take more time, more patience." Woods, who has had back surgery and is playing his first competitive tournament since missing the cut at the US PGA Championship in August, opened with a birdie but gave that shot back on eight before an eagle on the par-five 13th brought his round to life. A birdie followed on the 14th and another on the 16th had Woods four under for the round, but a rain delay of about 90 minutes after he finished the 17th halted his momentum. When he returned, he hit his approach to the 18th through the green and then duffed his chip and missed a 10-foot bogey-putt to leave him three-over for the tournament, which he annually hosts. 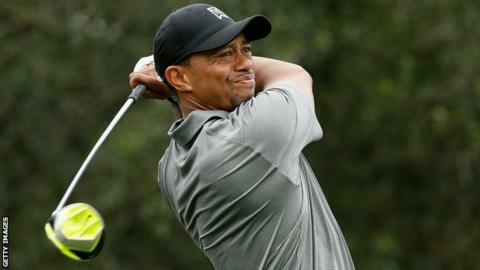 Woods, who is ranked 24th in the world, added: "I wasn't feeling my best. I just had to stay hydrated and try to keep things down." Northern Ireland's Graeme McDowell followed up his opening round of 68 with a one-over 73 to leave him on three-under and three places above Woods, who is 18th in the invitational field, four shots adrift of 17th-placed Billy Horschel.